& for TRANSLATIONS, click here. Landmark of German Romanticism Gorres, Joseph von. Die teutschen volksbucher. Naeere wurdigung der schoenen historien-, wetter- und arzneybuchlein welche theils innerer werth, theils zufalls, jahrhunderte hindurch bis auf unsere zeit erhalten hat. Heidelberg: bey Mohr & Zimmer, 1807. 12mo. ff., 311,  pp. Great Britain. Treaties, etc., 1760-1820 (George III). 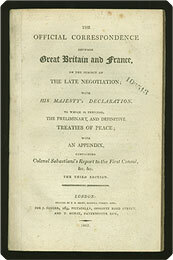 The official correspondence between Great Britain and France, on the subject of the late negotiation; with His Majesty’s declaration, to which is prefixed, the preliminary and definitive treaties of peace; with an appendix containing Colonel Sebastiani’s report to the First Consul, &c. &c. London: Pr. by D.N. Shury for J. Ginger, 1803. 8vo (21.5 cm, 8.5"). , –159, , xlv, [1 (blank)] pp.  Third edition, following two previous 1803 printings: Record of the short-lived attempt at peace made in 1802 with the Treaty of Amiens. French Post-Restoration Politics Grégoire, Henri. Seconde lettre aux électeurs du département de l'Isère. Paris: Librairie Constitutionnelle de Baudoin Frères, 1820. 8vo (19.3 cm, 7.6"). , 31,  pp.  First edition: The revolutionist leader Abbé Grégoire discusses his election to the Lower Chamber, and the subsequent annulment of that election. A Temperance Tome adapted for AMERICANS Grindrod, Ralph Barnes. Bacchus. An essay on the nature, causes, effects, and cure, of intemperance ... first American edition.... New York: J. & H.G. Langley, 1840. 12mo. xvi, 512 pp.  Stated first U.S. edition, adapted for the American public and dedicated “to the officers and members of the American Temperance Societies.” This prize essay submitted to the New British and Foreign Temperance Society opens with a history of drinking and of “intoxicating liquors” stretching back to the Philistines, Thracians, and Babylonians, followed by discussions of the moral and physical causes of intemperance, the results of indulgence, and the efficacy of various means of quitting drinking. One of the final chapters contrasts the temperance and intemperance of the Hebrews with those of the primitive Christians; in this chapter, the author promotes the theory that many biblical references to wine actually meant unfermented, non-intoxicating grape juice. Grindrod (1811–83) was a well-known British “water cure” physician and temperance crusader. For more TEMPERANCE, click here. 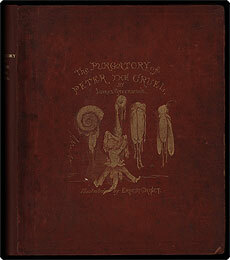  First edition. Born in Germany, Gros was a pastor and professor of both German and moral phlosophy at Columbia University. This work is the text version of a course he taught there, and is the “first treatise on Moral Philosophy written and published in America,” according to Sabin. For COLLECTED PRESSES & TYPOGRAPHY generally, click here. Early Study of Tuscan Literature from the Giunta Press Gualteruzzi, Carlo; Vincenzo Borghini, ed. Libro di novelle, et di bel parlar gentile. Nel qual si contengono cento nouelle altrauolta mandate fuori da Messer Carlo Gualteruzzi da Fano ... Con aggiunta di quattro altre nel fine. Et con una dichiaratione d'alcune delle voci piu antiche. In Fiorenza: Nella Stamparia dei Giunti, 1572. 4to (22.5 cm, 8.875"). , 153 (i.e., 165; 79–88 repeated),  pp.  Neatly printed collection of French-, Provençal-, and Italian-inspired stories primarily edited by Carlo Gualteruzzi, with four other stories edited by Vincenzo Borghini and an introduction for “alli studiosi della lingua Toscana” by Filippo and Jacopo Giunti. Considered by Dionisotti to be the first critical edition of an ancient text of Tuscan prose, this “nuovo ricorrette” edition comes after the first of 1525. Brunet notes of this edition that “l'auteur a réformé l'orthographe de celle de 1525,” and Gamba points out the two have varying content — that this printing features four new tales not found in the first edition. Boccaccio is believed to have borrowed the “Three Rings” story for his Decameron. The text is printed in single columns of roman and italic font with initials of varying decorative quality and size, some historiated, with different Giunta devices present on the title- and final pages. Binding: Rich green morocco, spine stamped and lettered in gilt with compartmental fleurons, covers framed and panelled in blind double fillets with gilt decorative corner stamps, board edges with single gilt fillet, turn-ins with decorative gilt rolls, marbled endpapers, all edges gilt. Signed binding by Capé, name camouflaged in lower front turn-in. Awen Anna Kije Manito?  CREE Guéguen, Jean Pierre. Kiskinoamati-Masinaigan gaie aiamie kokwedjimitowini-masinaigan, à l'usage des Sauvages du Saint-Maurice (Postes de Wemontaching, Okikendatc Manawan Coucoucache) et de Mekiskan. Publié sous les soins du Rév. Père Jean-Pierre Gueguen, O.M.I. Montréal: C.O. Beauchemin & Fils, Lib.-Imprimeurs, 1889. 16mo. 32 pp.  Designed for children. In addition to the abridged catechism in Cree, pp. –10 contain the alphabet and a primer, and pp. –17 prayers. At the top of the title-page: L.J.C. et M.I. WorldCat locates copies in only four U.S. and three Canadian institutions. The Life of the Courtier — Guevara, in Italian Guevara, Antonio de; Vincenzo Bondi, trans. Aviso de favoriti, e dottrina de cortegiani, opera non meno vtile, che diletteuole. In Venetia: Per Comin da Trino di Monferrato, 1562. 8vo (15.6 cm, 6.1"). 205 (i.e., 207),  ff.  Fray Antonio de Guevara (ca. 1481–1545) was a historian, bishop, court historiographer of Charles V, and acclaimed Golden Age literary figure. This volume presents an early Italian translation of his Aviso de prevados y doctrina de cortesanos — in which Guevara lays out the duties of courtiers (specifically, of the secular rather than religious members of a royal entourage) — along with the first Italian translation of the author's Menosprecio de corte, a popular, critical satire on courtly life. This printing is not common in the U.S., with WorldCat locating only six reported institutional holdings (Columbia, UCLA, UMichigan, UIllinois, Harvard, UWisconsin-Milwaukee, Huntington). Provenance: Title-page with traces of partially effaced early institutional armorial rubber-stamp; later in the library of American collector Albert A. Howard, small booklabel (“AHA”) at rear.